You can also shoose to share a sled with another guest pulled by 4-6 dogs. One of the guest is sitting on the sled and the other guest is steering the sled, the guests switch position during the tour. · Overnight stays at a wilderness camp and Full board is included. 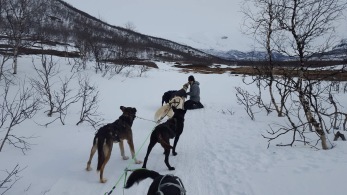 The tour also includes change of clothes and a shuttle from/to Kiruna C.
· Price: 7250 SEK/per person (own sled), 6250 SEK/per person (shared sled). There is a possibility of an extended tour. Contact us for more information and price.